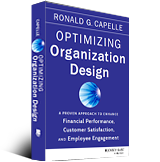 Optimizing Organization Design® is the Capelle Associates approach to improving company infrastructure. It is based on over 100 large scale projects and 24 research studies that Capelle Associates has completed over the past 25 years. There can also be numerous additional benefits. The research and client experience shows that this approach leads to better financial performance, customer satisfaction and employee satisfaction. It can provide a competitive advantage and a significant return on investment. It can also be the foundation for both strategy implementation and human resources management. Assessment: This includes information gathering, analysis and preparation of recommendations and reports, and follow up meetings. Implementation of agreed improvements: This includes people change management and project management. It uses a cascading, iterative process that is based on teams and involves education, doing real work and feedback. Our assessment approach can be tailored to your unique requirements. We would generally review documents and employee information, conduct interviews (primarily with managers) and provide access to our online employee satisfaction questionnaire. This results in analysis, recommendations, a report and meetings. It is comprehensive yet can be done quickly and requires minimal time from your organization. We can find opportunities for improvement that would not otherwise be found. Because our approach is robust, we find that about 80-90% of our recommendations are accepted. With regard to implementation, most of our clients believe that the best value comes from an internal – external team. Bring in methods, materials and skills. Work with your internal team to upgrade organization systems and practices. Train and qualify the internal team. The implementation involves a cascading, iterative approach using teams, education, real work and feedback. Our approach can be faster and provides better quality assurance. It is cost efficient since most of the work can be done by the internal team. Most importantly, it is sustainable. To find out more about our Optimizing Organization Design® approach and how it can be beneficial for your organization, please request a discussion by either calling 416-236-3044 or filling out our online form. The organization assessment you carried out provided excellent insights, and your recommendations set a baseline for improvements that we have made to the organization. In addition, the implementation consulting support provided us with methods, materials and training, so we did not have to “reinvent the wheel”. There is no question that you have helped us to achieve significant improvements in our organization.